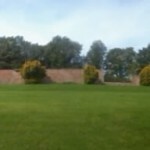 Directly opposite Richardson Dees Park with it’s entrance on Kings Road lie the picturesque grounds of Wallsend Hall. Pleasant tree-lined pathway’s which are a favourite route of dog walkers run along each side of the stream which through the middle of the Hall Grounds. Either side are various types of trees along with a decorative assortment of flowers and shrubs chosen because they are a natural habitat for bugs and water loving creatures. The Wallsend Park & Hall ground have recently undergone major redevelopment work which will ensure the people of Wallsend will be able to continue to enjoy fantastic walks well into the future.